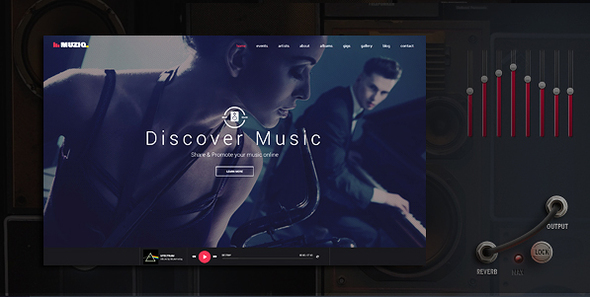 Muziq – Music Band & Musician WordPress Theme Created by jellythemes. This templates have specific characteristics, namely: Muziq has features such as High Resolution: Yes, Compatible Browsers: IE9, IE10, IE11, Firefox, Safari, Opera, Chrome, Compatible With: Visual Composer 4.11.2.1, Bootstrap 3.x, Software Version: WordPress 4.5.x, WordPress 4.5 . You can use this Muziq – Music Band & Musician WordPress Theme on WordPress category for artist, audio, band, dj, events, gigs, hip hop, indie, music, Music theme, musician, onepage, player, rock, singer and another uses. We have included retina display optimizations for all the main graphics used in the theme, so they look sharpon retina displays.